The sudden appearance of a new and brilliant star set the kings of the East on one of the Bible’s better-known journeys. Through the centuries, paintings have shown as many as eight kings. Some debate whether the magi were actual kings or a group of scholars, astronomers and priests. The Western tradition of three kings most likely arose from the three gifts of gold, frankincense and myrrh that they brought to “the newborn King.” James C. Christensen provides us with a gift to treasure the whole year through. 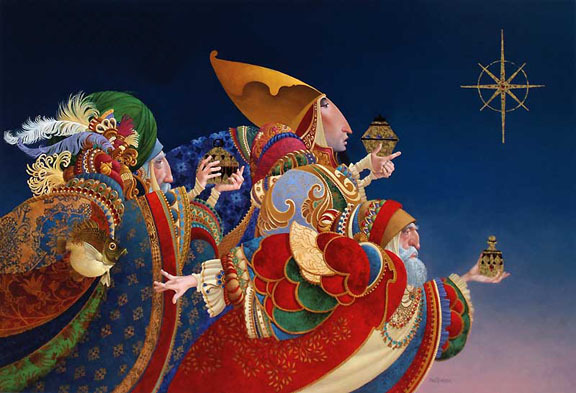 In his original painting, the star and the three gifts of the kings are gold leaf. For both the print and canvas editions, we were able to recreate this radiant effect, in fact, the canvas is hand-crafted with 22-karat gold leaf.